The One and Only Connecticut Twins with Great Classic Music! The Connecticut Twins were led by two twin brothers, Jas and Stas (John and Stanley) Przasnyski. Three members of this great band have been inducted to the International Polka Music Hall of Fame® including Jas and Stas Przasnyski as well as Richard Midura. John (Jas) Przasnyski was born a twin on May 25, 1926, in Bristol, Connecticut. John was the eldest of the two boys. After World War II, John attended the Julius Hartt School of Music in Hartford and learned to play the drums. From the point, he was attracted to the music business and though he held daytime jobs, his heart was all music. As a member of the popular Connecticut Twins, they produced 16 albums on the Stella label. The band traveled to many locations and played almost every major hotel in New York City. John met his wife, Florence, at a dance at the Polish National Home in Hartford, Connecticut in October of 1954. They were married September 10, 1955 and had two daughters, Florence Christine and Diana Lynn. Diana and her husband Richard Kubena had two sons, Richard, who was age 14, and Robert, 8 years of age, at the time of John’s induction in the Polka Music Hall of Fame. Under his own name and personal leadership John made three more albums; two on the Starr label and the other for J.P. Records. John was still very active and performing at the time of his death from Leukemia on December 28, 1996. He was age 70. Born in 1926 in Bristol Connecticut, Stas Przasnyski started to study the accordion at age ten while attending St. Stanislaus School. At the age of thirteen he was playing professionally at social affairs, concert solos, and private parties. He started a four-piece band at the age of eighteen. A typical Saturday consisted of a one hour broadcast over Radio station WBIS, a wedding reception from 2-6PM, a night club from 8PM-Midnight, and then played a place called the “Bottle Club” from 1-3AM. In 1952 he made his first recording for the Stella Music Company of New York using the name of “The Connecticut Twins Orchestra”. Original compositions included in that recording were “Polish Wedding Polka”, “My Girl Friend Polka”, “No Gonna Drink Oberek”, “John and Katie Polka”, “Sugar Daddy Polka”, and “Accordion Magic Polka”. 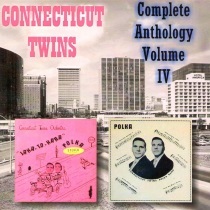 As a result of the popularity of the Connecticut Twins, they produced a total of 16 long playing albums on the Stella Label. It was due to these recordings that took the band on personal tours to Oshawa, Canada, as far south as Baltimore, Maryland, and back in 1962 as far West as Chicago. The band played at every major hotel in New York City, as well as the New York World’s Fair in 1966 as well as the Roseland Ballroom on Broadway. The band traveled so much that they only played one Saturday night a year in Connecticut. He was married in 1948 to Genevieve Sieruta also from Connecticut and they are the proud parents of two sons, Stas Jr. and Vance. The numerous recordings featured Stas Jr. vocalizing the Grey Horse Polka while his wife Genevieve and son Vance vocalized a polka titled “Fortune Polka”. These were all sung in Polish. Outside of playing in the band he was also a disc jockey from 1962-1982 over radio station WBIS and was the promoter of a number of successful Cancer Telethons. When the biggest polka recording of all time “The Beer Barrel Polka” was released in 1939, RCA Victor wanted to stop paying royalties to Germany and The Will Glahe Orchestra. They called upon Bernie (Wyte) Witkowski Orchestra to reproduce a new master recording. Bernie asked Stas to perform on the recording because the flipside featured a tune called “Hot Pretzel Polka”, which had a accordion solo that took up 80% of the song. It was then that the A&R (Artist and Repertoire) man for RCA congratulated Stas for imitating the technique of another accordion player to perfection. Stas also performed with the Bernie Witkowski Orchestra in 1975-76 at Madison Square Garden for the Harvest Ball. He has also recorded with a number of groups on various labels like Remington, Harmonia, RCA Victor, Dana Stella, and Bel-Aire. He and his wife and Stas Jr. resided in Deland, Florida, and are the proud grandparents of Desiree and Jashua. His induction into the Polka Music Hall of Fame was long overdue and took place on Sunday, August 7, 1993, during the IPA 25th Anniversary Induction Ceremonies. Richard Midura was born on August 12, 1935 in Chicopee, MA. Know as “The Pioneer of Polka Clarinet Improvisation” by his peers, he lent his smooth clarinet and saxophone mastery to the live performances and recordings of the most prominent Eastern Style Polka Bands of his day. Mr. Midura’s unique playing style influenced generations of polka clarinetists. Over his career he toured with Ed Swierand’s Aristocrats, Al Soyka, Gene Wisniewski, Eddie Siwicki, Al Cocoa, Walt Solek, Ray Henry, and the Connecticut Twins. On June 7, 1956, he appeared on National Television performing the Clarinet Polka on the Ed Sullivan Show. Later in life, he helped raise money for polka broadcasting by hosting radio shows on WMUA in Massachusetts. For his many accomplishments in the polka industry, Richard Midura has been deemed deserving by the electorate of the International Polka Association for induction into the Polka Music Hall of Fame®. For a long time we at PolkaConnection.com have been asked “Do you have any Connecticut Twins on CD?” Here it is! The Connecticut Twins are on CD. Don’t pass this CD today-two former albums now on one CD!